On the 25th August the Department of Finance in Canberra announced that its bold experiment in providing a central website infrastructure for agencies, Govspace, was coming to an end after almost seven years. I still remember feeling excited at the original launch of Govspace. At the time I was working in the Department of Health as Online Communications Director. I was theoretically responsible for the department's entire web presence, although many of the 150+ websites operated by the department were directly controlled by the business area funding their development. It was still a time when business areas wanted a new website for every new initiative and would pay through the nose for those sites. Business areas would often spend tens or even hundreds of thousands of dollars to digital agencies, or our internal IT team, to have each new site built. It was a frustrating time for me as there wasn't a simple way for the department to procure low cost sites. We didn't have the capability to easily build or buy websites based on open source web content management systems (WebCMSes), such as WordPress, that used free or cheap themes rather than hand-crafted custom-designed graphical interfaces. Even Health's internal IT team had to charge six figure sums for simple websites due to the costs they had to incur and offset when using the department's mandated internal web content management platform (Lotus Notes) to deliver them. Each internally built site had to be custom coded and designed by experienced IT staff, making it a relatively slow, as well as expensive, process. So when the Australian Government Information Management Office (AGIMO) in the Department of Finance unveiled Govspace in March 2010, the floodgates opened. Suddenly every agency could access a low-cost open source webCMS on pre-approved secure government infrastructure. It could be used to deliver both small specialist websites as well as services such as blogs. Finance were trusted, reliable, secure and a central government agency - one of 'us' (government) not one of 'them' (private sector companies). Govspace launched with a single pilot site, the Department of Treasury’s Standard Business Reporting blog. The platform expanded quickly, reaching 25 sites using the platform in a year. I was one of the first to leap on. I worked within Health to dissuade one of our Communications teams from paying a digital agency at least $40,000 for a new website for an information campaign and convinced them to trust me (and Finance) to make use of the Govspace infrastructure - which at the time came at the very attractive price of 'free'. Finance was able to spin the site up in a matter of weeks, WordPress was easy to use, so the Comms team was able to directly put the content in place. We had the website live within six weeks - compared to a 3-6 month process with a digital agency. In the end we did spend some public money, about $42 on a custom WordPress theme, but saved the department over $35,000. At an internal planning day shortly after the site went live the Comms team proudly shared how easy it had been to get the website in place. This lead to a flood of interest from other area. That one site raised the internal awareness that the Department had been paying too much for websites, leading to enormous savings over time. Govspace wasn't designed to cater for every site - it was primarily a platform for simple Gov 2.0-style sites, with blogs and other interactive features. Even so my team helped put at least another half-dozen new websites onto the platform over the next few years. Even when Finance had to bite the bullet and start charging agencies for the costs they incurred for the platform, Govspace remained one of the lowest cost website options for government. You can read the posts from the first birthday of Govspace, from AGIMO's then Branch Manager, Peter Alexander (now COO for the Digital Transformation Office) and from AGIMO's Mike T (with my comment still below). Govspace continued to grow in use over several years, with over 110 government sites using the platform at some stage. The chart below shows the traffic for periods I've been able to source data for. Over the last few years the site has seen a natural decline as agencies shifted to GovCMS, Drupal or their own lower cost WebCMS frameworks. Today Govspace hosts 26 live public sites - virtually the same number as the platform had after 12 months. With Finance's decision to close the platform all those sites will have to move to their own infrastructure by the start of 2017. After that, Govspace will be no more. While this makes me sad, I support the decision by Finance to close down the GovSpace platform. It had a good run. 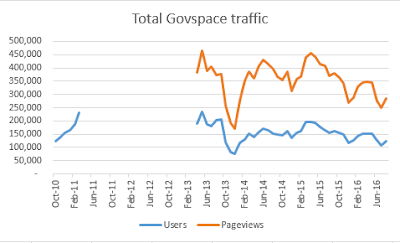 However Govspace is fast being replaced by more modern web platforms, particularly GovCMS. I'd like to personally thank all the relevant staff at the Department of Finance for how diligently they ran and maintained the platform, even after AGIMO was disbanded and running a whole-of-government infrastructure stopped being an important role for the department. While for many inside and outside government the closure of Govspace might be seen as just the termination of a 'surplus to needs' service, I believe this is the end of an era for government IT. Govspace was instrumental in revolutionising many aspects of how Australian government viewed digital. The platform helped transform how Australian government agencies looked at website development and costs. The use of WordPress for a public whole-of-government platform also widened the door for open source software to be considered by agencies. Govspace helped propel government web sites from a 20th century 'brochure-ware' approach to become more engaging and interactive. The impact of Govspace has echoed across government, and will continue to echo for years to come as agencies continue on their digital transformation journeys. Farewell Govspace and thank you to everyone involved with the platform. Your contribution to government's digital transformation has not been overlooked.